So we are back, up and runnig! Traditionally we start the year with the special giveaway from FireSupport: The Firesupport Jan 2018 £3500 prize giveaway! Firesupport Jan 2018 £3500 prize giveaway! There are still a few days left with great prices! Only internet orders qualify in the draw. Total prize value £ 3500,-! Firesupport £3500 prize giveaway Januari 2017! 32 prizes over 31 days. All internet orders qualify in the draw. Total prize value £ 3500,-! Every day a winner is drawn from the qualifying orders that day. 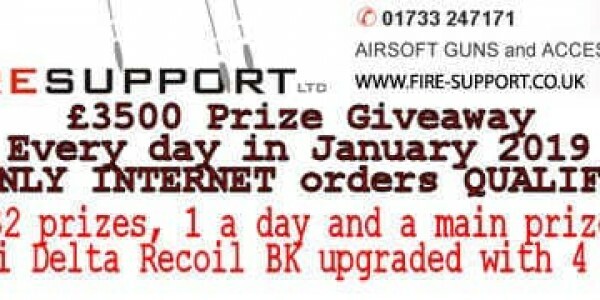 At the end of the month all qualifying entries from the whole month then go into a final draw to win a Marui DEVGRU upgraded woth over £700!!! 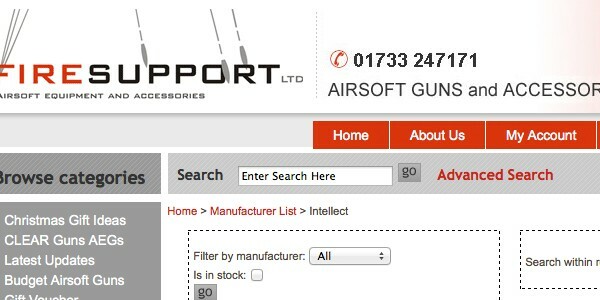 Gun prizes in UK can only go to members of insured airsoft sites or UKARA registered players, rest of Europe can win any prize (additional postage will be needed from non UK mainland winners). Prize winners and prizes announced on facebook every day. Massive range is now available from stock! FireSupport is well known for the huge stock piles of patches, ICS and Madbull. As of todaym there is plenty of stock available again for Madbull lovers!